The music industry is inundated with manufactured hip hop but its true roots are alive and growing. A new generation mixed with a classic vibe is emerging from the hip hop scene which offers familiar beats with a futuristic style. Coming from Chicago is producer Bryan Ford and New York-bred Wu Tang alum, Killah Priest who have joined forces for the new album, For The Future of Hip Hop which is released on Revolutionary Music today (Friday, May 6th). The album features an East Coast lyrical style over futuristic productions which creates a unique sound that stands out in the world of hip hop. Chicago emcees Pugs Atomz and Awdazcate are guests on the LP adding some Midwest flavor to the East Coast lyricism. 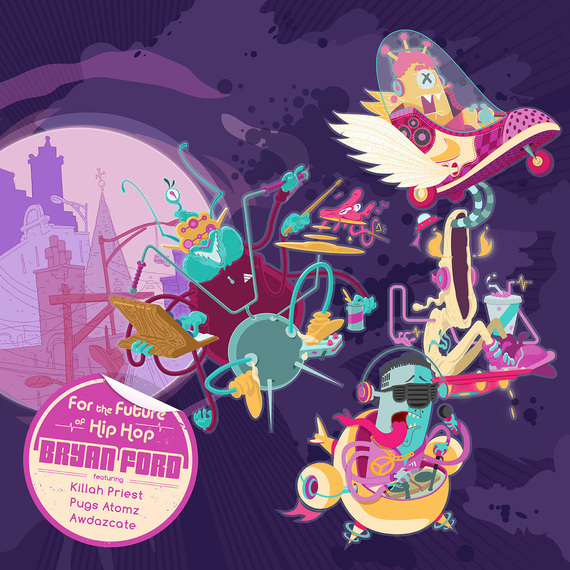 The first single and title track, "For The Future of Hip Hop" has an accompanying music video that features Killah Priest, Pugs Atomz and Awdazcate immersed in dark and tripped out scenery. Reminiscent of the past with Blade Runner-esque undertones, the video is a synthesis of past, present and future. Decorated in moments of psychedelia, Killah Priest introduces himself as "coming down from the Cosmos and landing in Chicago...hip hop astronaut, like acid drops," lending to a galactic trip of radioactive flows and cosmic beats. Pugs Atomz references space-time travel and relativity visualized, taking hip hop to a new level beyond the stratosphere, something Stephen Hawking might even appreciate. The future of hip hop, however, is not all about the space-time continuum and sci-fi aesthetics, but rather it is a movement into a new frontier and this frontier can take on any number of facets. The Flamenco-influenced "Just Me and My Girl" opens with the sweet sounds of classical guitar played by Ford, as nylon strings dance and twang through our ears. As a soothing beat is introduced, Pugs and Awdaz's soulful vocals carry the listener through this melodious track. "The song pretty much wrote itself," explains Ford. "It was one of those magic studio moments where it all just came together." "Just Me and My Girl" show's Ford's musical range and skill and how he is truly reshaping the future of hip hop. Having been producing since the late '90s under the names Lake Street Project, B. Ford, and Terry Swank, he has mastered the guitar, bass, keys and drums. He plays all of his own instruments, including the drums in "For the Future of Hip Hop" and even in his samples. "Typically when I sample, it's when I sample myself," says Ford. Though he has dabbled in electronic music, he always returned to his true love: hip hop. When Ford discovered that Killah Priest, one of his favorite emcees, was in Chicago, he invited him to the studio to collaborate on a track. That one track turned into an entire album, The Future of Hip Hop, when they discovered their musical chemistry. "The kid has no limits in music," says Killah Priest, who is now living in Los Angeles, of working with Ford. "The more I think, the more he can do!" The album is diverse yet well-rounded, speaking volumes of hip hop's new trajectory. Bryan Ford, Killah Priest, Pugs Atomz and Awdazcate are redefining the genre while staying loyal to its roots. The true future of hip hop is diverse and limitless and artists like Ford are the pioneers in exploring this freedom.